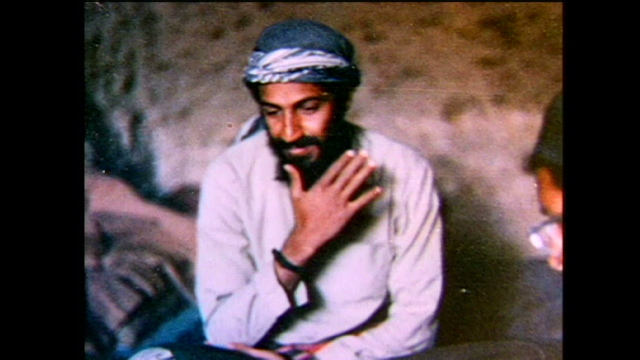 (CNN) -- A look back at some key moments in the life of Osama bin Laden, including attacks that he was purportedly behind and messages attributed to him. * 1957 -- Osama bin Muhammad bin Awad bin Laden is born in Riyadh, Saudi Arabia. He is the 17th of 52 children fathered by Muhammad Awad bin Laden, a Yemeni immigrant who built a billion-dollar construction company in Saudi Arabia. His mother is Hamida al-Attas, who was from Syria. * 1979 -- Bin Laden graduates from King Abdul Aziz University in Jeddah with a degree in engineering. He goes to Afghanistan to join the "jihad," or "holy war," against the Soviet Union. He remains there for a decade, using construction equipment from his family's business to help the Muslim guerrilla forces build shelters, tunnels and roads through the rugged Afghan mountains, and at times taking part in battle. * 1980 - 1989 -- Bin Laden raises money for the mujahedeen fighting in Afghanistan and also provides them with logistical and humanitarian aid. During these years, he also personally fights in battles against the Soviet Union. * 1988 -- Bin Laden founds a group he names Al-Qaeda, which in Arabic means "the base." * 1989 -- The Soviet Union withdraws from Afghanistan. Bin Laden returns to Saudi Arabia to work for the family construction firm, the Bin Laden Group. * August 7, 1990 -- Following the Iraqi invasion of Kuwait, U.S. troops arrive in Saudi Arabia in order to have a close base to eventually go after Iraqi leader Saddam Hussein's troops. Bin Laden becomes outraged at the U.S. forces' presence near the Muslim holy sites of Mecca and Medina. * 1991 -- Bin Laden is expelled from Saudi Arabia by its regime. Eventually he and his followers relocate to Sudan, funded by assets that had grown to as much as $250 million, according to some officials. In that African nation, al Qaeda begins to evolve into a terror network. 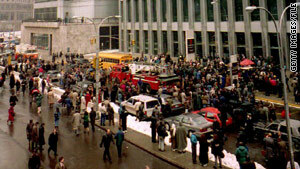 * February 26, 1993 -- A bomb explodes at the World Trade Center in New York City, killing six and wounding hundreds. 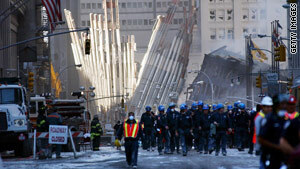 Six Muslim radicals, who U.S. officials suspect have links to bin Laden, are eventually convicted for the bombing. Bin Laden is later named along with many others as an unindicted co-conspirator in that case. * October 1993 -- Eighteen U.S. servicemen, all of them part of a humanitarian mission to Somalia, are killed in an ambush in Mogadishu. Bin Laden later says that some Arab Afghans were involved in the killings and calls Americans "paper tigers" because they withdrew from Somalia shortly after the soldiers' deaths. * 1994 -- The Saudi government officially strips bin Laden of his citizenship, freezing all the remaining assets he has in the country. His family disowns him as well. That same year, Bin Laden is the target of an assassination attempt. Afterward, he strengthens his personal security detail. In the following months, officials believe he funds and directs a series of attacks, including a failed attempt to kill Egyptian president Hosni Mubarak and a 1995 suicide bombing at the Egyptian embassy in Pakistan. Authorities now believe that this marked the early days of a growing alliance between bin Laden and other militant Islamic groups, including the Egyptian Islamic Jihad and its leader Ayman al- Zawahiri. 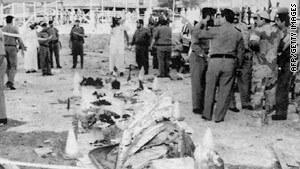 * 1995 -- A truck bombing at a military base in Riyadh, Saudi Arabia, kills five Americans and two Indians. * 1996 -- Sudanese officials expels Bin Laden from their country. He moves with his children and three wives to Afghanistan, where he receives support from the fundamentalist Taliban regime. That year, U.S. authorities indicts bin Laden on charges he helped train the people involved in the 1993 attack that killed 18 U.S. servicemen in Somalia. * June 25, 1996 -- Nineteen U.S. soldiers die in a bombing of the Khobar military complex in Saudi Arabia. * August 23, 1996 -- Bin Laden declares a holy war against U.S. forces. He signs and issues a Declaration of jihad from Afghanistan entitled, "Message from Osama bin Laden to his Muslim Brothers in the Whole World and Especially in the Arabian Peninsula: Declaration of Jihad Against the Americans Occupying the Land of the Two Holy Mosques; Expel the Heretics from the Arabian Peninsula." * 1997 -- In his first interview with Western media, bin Laden tells Peter Bergen -- now a CNN analyst -- that the United States is "unjust, criminal and tyrannical." "The U.S. today, as a result of the arrogant atmosphere, has set a double standard, calling whoever goes against its injustice a terrorist," he said in the same interview. "It wants to occupy our countries, steal our resources, impose on us agents to rule us." Bin Laden also says that "Arab holy warriors" trained in Afghanistan had banded with Somali Muslims in October 1993 to kill 18 U.S. soldiers in a bloody battle on the streets of Mogadishu, Somalia. He says, "The U.S. today has set a double standard, calling whoever goes against its injustice, a terrorist. It wants to occupy our countries, steal our resources, impose agents on us to rule us, and then wants us to agree to all this. If we refuse to do so, it says we are terrorists." * February 1997 -- According to court documents, bin Laden orders the militarization of the East African cell of Al Qaeda, a move that culminated in the bombing of the U.S. embassies in Kenya and Tanzania on August 7, 1998, eight years to the day after U.S. troops landed in the Saudi kingdom. * 1998 -- Bin Laden's Al Qaeda and the Egyptian Islamic Jihad, led by Ayman al- Zawahiri, merge, according to U.S. prosecutors. * February 1998 -- Bin Laden and al Zawahiri endorse a fatwa under the banner of the "International Islamic Front for Jihad on the Jews and Crusaders." This fatwa, published in the newspaper, Al-Quds Al-Arabi, on February 23, 1998, states that Muslims should kill Americans -- including civilians -- anywhere in the world. * May 7, 1998 -- Bin Laden associate Mohammed Atef sends Khaled al Fawwaz a letter discussing the endorsement by bin Laden of a fatwa issued by the "Ulema Union of Afghanistan" which termed the U.S. army the "enemies of Islam" and declared jihad against the U.S. and its followers. The fatwa is subsequently published in Al-Quds Al-Arabi. * May 29, 1998 -- Bin Laden issues a statement entitled "The Nuclear Bomb of Islam," under the banner of the "International Islamic Front for Fighting the Jews and Crusaders." In it, he states that "it is the duty of Muslims to prepare as much force as possible to terrorize the enemies of God." * August 7, 1998 -- A pair of truck bombs explode outside the U.S. embassies in Nairobi, Kenya, and Dar es Salaam, Tanzania. Some 224 people are killed. The FBI offered $25 million for information leading to bin Laden's capture and conviction. * June 7, 1999 -- He appears for the first time on the FBI's Ten Most Wanted Fugitives list. * May 2000 -- In the Philippines, Muslim separatist guerrillas who seized 21 hostages at a diving resort in Malaysia publicly announce that they are being supported by bin Laden. * October 12, 2000 -- Bin Laden is linked to the attack on the USS Cole in Yemen, which leads to the death of 17 sailors and injuries to another 39. 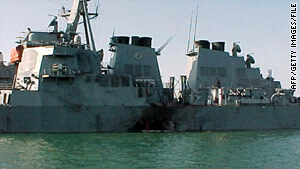 USS Cole in Yemen in October, 2000. * 2000 -- Algerian Ahmed Ressam pleads guilty in connection with a failed plot to bomb Los Angeles International Airport during the millennium celebrations. He claims he was trained in urban warfare and explosives at an Afghanistan camp run by bin Laden. * May 29, 2001 -- Four of bin Laden's alleged supporters are convicted of the 1998 bombings of the U.S. embassies in Africa. * August 14, 2001 -- Bil Laden's last statement prior to 9/11 attacks is given to Al Rai Al Aam newspaper. * September 2001 -- Four U.S. commercial aircraft are hijacked and then crashed in New York, Washington and Pennsylvania, leading to the deaths of more than 3,000 people. 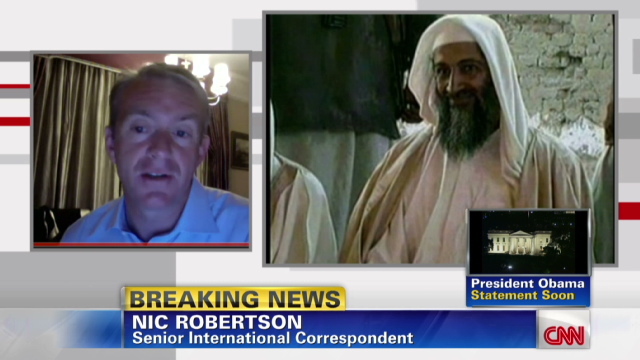 Soon thereafter, the U.S. government names bin Laden as a prime suspect. 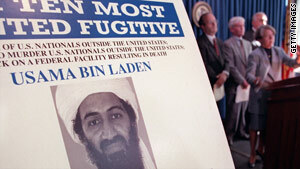 * November 2001 -- U.S. forces drop leaflets in Afghanistan offering a $25 million bounty for bin Laden. * December 1, 2001 -- Hazarat Ali, security commander for Jalalabad, reports there was a bin Laden sighting on November 27 in the Tora Bora region. Hundreds of Afghan fighters with American and British Special Forces head to that area to launch a major assault. * December 25, 2001 -- The Pakistan Observer publishes details of bin Laden's funeral. On the front page, the newspaper reports that an unnamed Taliban leader said bin Laden "had a peaceful natural death in mid-December in the vicinity" of the Tora Bora mountains. The report says that his death was the result of a "serious lung complication." "He was laid to rest honorably in his last abode" in a grave prepared according to the beliefs of the fundamentalist Wahhabi sect of Islam to which the Qaeda leader belonged, the report says. * December 27, 2001 -- Afghan officials report that bin Laden is in Pakistan, along with al Qaeda sympathizers. * January 18, 2002 -- Then Pakistani President Pervez Musharraf says that Osama bin Laden might have died of kidney failure in Afghanistan after becoming separated from a dialysis machine he had used in recent years. * February 15, 2002 -- Reports go out to top levels of the U.S. government stating bin Laden survived the U.S. bombing assault on his alleged hideouts. They are vague and lack solid evidence that he could be near Afghan-Pakistan border, such as sightings by witnesses or interception of radio transmissions with his voice. * March 9, 2002 -- A Saudi-owned publication quotes one of bin Laden's wives. The woman, identified only as A.S., said she "feels deep down that he's still alive and that the whole world would have known if he had been killed. 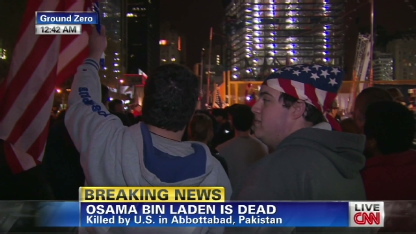 Osama's death cannot be hidden." * May 17, 2002 -- A Saudi-owned newspaper publishes quotes from fugitive Taliban leader, Mullah Mohammed Omar in which he states, "Sheikh Osama is still alive, praise God, and this is causing anguish to (U.S. President George W.) Bush who promised his people to kill Osama, not knowing that lives are in the hands of God." * June 12, 2002 -- A Russian newspaper publishes what it claims is an interview with Omar. 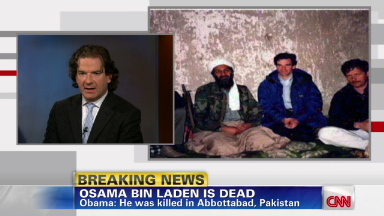 The ousted Taliban leader states that bin Laden is alive in Afghanistan. "Osama helped us during the war with the Russians, he would not leave us now," the newspaper quotes Omar as saying. "The Holy War is only just beginning. The fire from this war will reach America, and it will burn the capital that launched an unjust attack on Muslims." * July 2002 -- Abdel-Bari Atwan, editor of the London-based Al-Quds Al Arabi newspaper, says the al-Qaeda leader is in good health, but had been wounded in an attack on his base in Afghanistan last December. Atwan says that Bin Laden's followers had told him that he would not make more video statements until his group launches another attack on the United States. * March 10, 2005 -- Muslim clerics in Spain issue what they called the world's first fatwa, or Islamic edict, against Osama bin Laden. They called him an apostate and urged others of their faith to denounce him. The ruling is issued by the Islamic Commission of Spain, the main body representing the country's Muslim community. * October 2009 -- The book, "Growing Up bin Laden: Osama's Wife and Son Take Us Inside Their Secret World," written by Najwa and Omar bin Laden is published. * December 2009 -- A U.S. government official admits a "lack of intelligence" on bin Laden's whereabouts, noting he could be in Afghanistan or Pakistan. Defense Secretary Robert Gates tells ABC that "it's been years" since there was good intelligence on the al Qaeda leader's location. * January 29, 2010 -- A man thought to be bin Laden is heard on two audiotapes, released in the span of a week. On the first, he claims responsibility for the alleged Christmas Day attempt by Nigerian national Umar Farouk AbdulMuttallab to blow up a Northwest Airlines plane as it neared Detroit, Michigan, from Amsterdam in the Netherlands. On another tape -- aired days later, also on Al-Jazeera -- a similar voice blames the United States and other industrialized nations for causing climate change. * March 2010: An audiotape purportedly from bin Laden hints at retaliation if alleged 9/11 mastermind Khaled Sheikh Mohammed is executed in the United States. * October 2010: A message from someone thought to be bin Laden appears on jihadist forums urging Muslims to help people suffering from famine, floods, a lack of clean water and the effects of climate change. At the time, a U.S. official says that bin Laden has been in communication with al Qaeda affiliate within Pakistan and beyond, encouraging them to take more military actions. Weeks later, a speaker in an audiotape -- purportedly bin Laden -- warns France to get its troops out of Afghanistan and not to oppress Muslims at home. "As you kill us, we will be killed," the voice says. "As you imprison us, you will be imprisoned." * August 2010: U.S. President Barack Obama is briefed on a "possible lead" about the location of bin Laden. Obama said nine months later that intelligence agents pressed to get more information in the subsequent months. * January 2011: A speaker claiming to be bin Laden warns French troops to leave Afghanistan -- or else two French journalists abducted by militants there could be killed. The man warns France that its alliance with the United States could prove costly. * April 2011: President Obama said he believes that there is by then enough credible intelligence about the terrorist leader's whereabouts, setting in motion the military operations. * May 1, 2011: "A small team of Americans" -- later identified as U.S. Navy SEALS -- engage in a firefight in Abbotabad, Pakistan, killing bin Laden in the process, according to Obama. The U.S. troops, none of whom are harmed in the operation, carry out the al Qaeda leader's body.